Kieran Collier performing at the Emerson Poetry Project. Photo by Lucie Speirs. Kieran Collier is a Boston-based writer and educator. 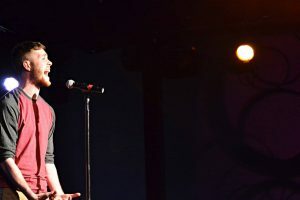 He first discovered the Boston Poetry Slam as a freshman at Emerson College, where he went on to be the president of the Emerson Poetry Project and the first four-time CUPSI member in the school’s existence. Catch him marveling at the joy people can capture in their work while drinking a Dirty Shirley. He is the author of When the Gardener Has Left (Wilde Press, 2015) and This to You (Beard Poetry, 2016). His work has been featured in the anthologies MultiVerse: A Write Bloody Superhero Anthology and Again I Wait for This to Pull Apart. He believes in the intersection of writing and education and that children are smarter than adults. His favorite color is orange. You can contact him via Twitter @kieranwcollier or email kieranwcollier@gmail.com to book him to feature, purchase his books, or talk about pop punk.